The last book written by Diana Wynne Jones, The Islands of Chaldea brims with Jones's characteristic sense of wonder, wit, and whimsy. A fitting hurrah from the undisputed grandmaster of children's fantasy. A stand-alone novel of magic and adventure by the renowned fantasy author Diana Wynne Jones, who also wrote Howl's Moving Castle and the Chrestomanci books. Almost finished upon her death in 2011, the manuscript was completed by Diana's sister Ursula Jones, an acclaimed novelist and actress. 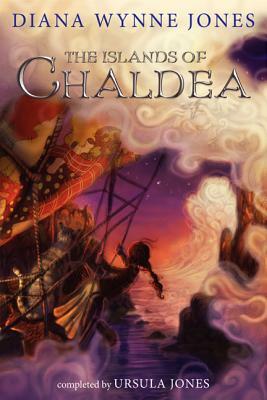 Publishers Weekly called The Islands of Chaldea "a story to cherish" in their starred review. Aileen comes from a long line of magic makers, and her aunt Beck is the most powerful magician on Skarr. But Aileen's magic has yet to reveal itself, even though she is old enough and it should have by now. When Aileen is sent over the sea on a mission for the King, she worries that she'll be useless and in the way. A powerful talking cat changes all of that—and with every obstacle Aileen faces, she becomes stronger and more confident, until her magic blooms. This stand-alone novel, by the beloved and acclaimed author of such classic fantasy novels as Howl's Moving Castle and the Chrestomanci books, will be welcomed by fans old and new. "Jones's imaginative vigor is unabated in this last, picaresque novel; her deft, fluid style and penchant for precise, characterful description are amply present," proclaimed The Horn Book. Ursula Jones is an actress, children’s author, and playwright. She has performed with the Royal Shakespeare Company and the Unicorn Theatre for Children. Her books include The Youngsters and The Lost King. She lives in London.